Loudoun County Tennis Academy would like to congratulate the Brambleton Middle School Varsity Tennis Team, as they defeated Belmont Ridge Middle School 6-3 to win the title of Regional Champions. 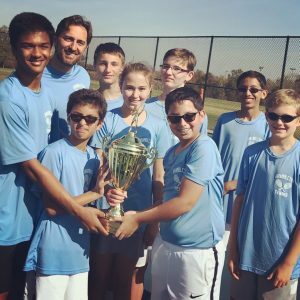 Loudoun County Tennis Academy Middle School Tennis League follows the Virginia High School League (VHSL) tennis scoring procedure; the first team to win five individual matches wins the team match. The six singles matches are played first. One by one as the players were finishing their singles matches, the score of the match went back and forth. After five matches were complete, the overall score was three wins for Brambleton and two wins for Belmont Ridge. The #2 singles match between B. DeLuise and S. Kudum was a key one, and when Bella Grace DeLuise won in a tie-break, Brambleton led the overall match, 4-2. The number two doubles team A. Chadha /J. Pizzino clinched the final win for Brambleton by defeating B. Drake/A. Ramirez, 8-2. 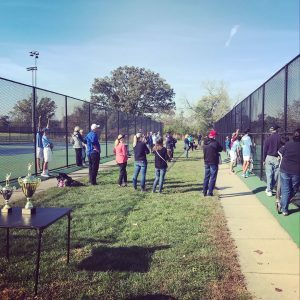 The middle school tennis league as envisioned by Jeanise Rosado has many similarities to high school tennis. When Jeanise’s oldest daughter, a rising 6th grader, looked into the options in sponsored sports for middle school students, she found only two options. “We moved to a new area in Loudoun and my daughter was about to enter middle school and only knew three girls. I told her to join a sports team. There were two school-sponsored teams for girls, basketball and volleyball. Neither one interested my daughter.” That is when Jeanise was determined to create a middle school tennis league. Within the county the boys leagues have taken off in numbers. 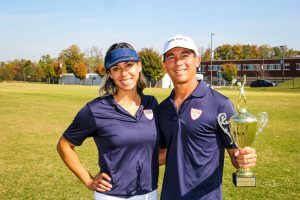 By offering a co-ed tennis league, the girls have an opportunity to play at a level where the physical development does not play a significant factor in competition. 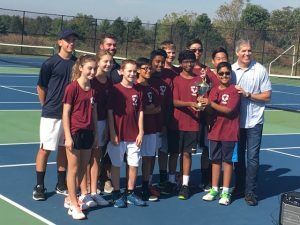 With the support of the Loudoun County Parks and Recreation, Loudoun County would be the first in the area to offer a middle school tennis league of this kind. Although Jeanises’ inspiration came from her daughter, the league reached success in its inaugural season with the support of all the parents and key individuals, most notably, her husband Luis Rosado, founder of Luis Rosado Tennis Academy, along with Laura Schamus, Chris Snow, Anthony DeLuise, Kevin Roudabush, JC Campbell, Sean Moran, Maleke Nublis and Karolina Sharma. With the close of the Fall 2017 tennis season, Loudoun County Tennis Academy assures there will be more to come for the Spring 2018 season. Middle school programs like this offered through the county are critical for our youth in their social and emotional development. Team tennis makes a perfect platform and having co-ed teams can help provide that needed element. We look forward to the future success of Loudoun County Tennis Academy.